v1.0.3 provides some minor updates for compliance with Palm Catalog requirements. v1.0.2 brings Flightlog in sync with the PalmCatalog submission version. Minor bug fixes and adjustments needed for the submission. Appreciate any and all feedback! Due to popular request, David and I have pulled out the flight log functionality from our FlightBriefer application. 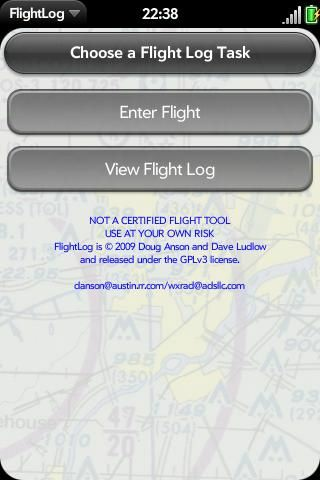 FlightLog is an aviators flight logging utility. It has the exact same functionally as the flight log feature in our FlightBriefer application. We dont have backup/restore features yet - so be aware of that. However, we would really appreciate feedback if we are on the right track with the logging fields - are we missing any key ones?